Brian Beattie produced another album which was released in the U.K. in 2006 on Sketchbook records and on Daniel's label Eternal Yip Eye Music in 2008. Mark Linkous and Sparklehorse collaborate with Daniel bringing to life twelve songs including "Syrup of Tears", "Mountain Top", "The Power Of Love", "Wish", and eight others. Possibly the most "accessible" sound from Daniel's history. Paul Leary produces this 1994 album with Daniel eloquently preserving Daniel's urnst appeal and wrapping it in listenable musical support. Now Available on Daniels Eternal Yip Eye Music label!!! 1999 Brian Beattie production. Enhanced CD Studio Stereo. 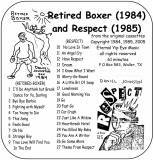 Between 1999 and 2001, it was published by New Improved Music, Which Records, Pickled Egg, and Gammon Records. Now the ENHANCED CD with music video "Davinaire" by Mark Miller has been released on Daniel's label Eternal Yip Eye Music. Liner notes by otiginal album producer, KRAMER. 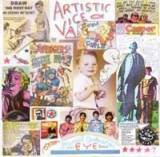 Digitally re-mastered CD re-released in August, 2008 on Daniel's own label Eternal Yip Eye Music (EYE-115). Liner notes by the original producer, KRAMER. Recorded with friends in a house in West Virginia, this was a masterpiece. 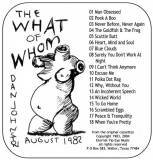 All songs by Daniel Johnston, accompanied by his friends. 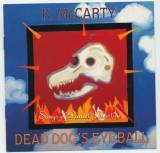 Bar-None Record's re-release of Kathy McCarty's 1994 album of Daniel Johnston COVERS "Dead Dog's Eyeballs"
A DIGITALLY RE-MASTERED copy of the casesette from July 1982 - date-wise it is the SECOND album of Daniel's music. Archived CDs are CDRs and come in a plastic case reminicent of the cassette tape days. The quality is better than ever. The TWO CASSETTES from Daniel's archives combined on one CD. Archives CDs are CDRs and come in a plastic case reminicent of the cassette tape days. A RE-MASTERED copy of the cassette from 1983. 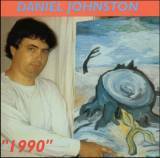 A DIGITALLY RE-MASTERED copy of the cassette from August 1982 - date-wise it is the THIRD album of Daniel's music. 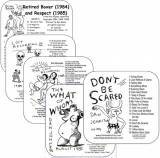 Get all five "archive" CDRs (containing 6 early cassette albums) at a combined price of $50 (save $10). 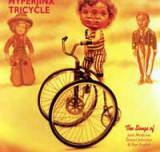 Over five hours of hypnotysing relentlessly creative material from the early 80's. All these CDs were previously distributed on cassette tapes only. October 2006 release of COVERS of Daniel's music by 21 artists. Released by KRAMER of www.secondshimmy.com. A compilation of songs written by Brett Hartenbach, covered and interpreted by musicians across the nation who have worked with and love Brett. This is the ONLY place you can currently get a copy of Daniel singing "WHIZ KID!" Whiz Kid was originally distributed as a single in the 90's. 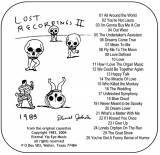 A 2002 compilation consisting of various songs by Daniel Johnston, NYC Painter Ron English, and Jack Medicine. Three of the songs are written by Daniel, those and several others performed by Daniel - including "Happy Springfield" which was done for Matt Groening.